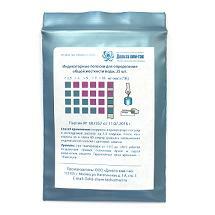 Total hardness test strips | ООО "Дельта хим-тэк"
The total hardness test can be used to measure water hardness. Water hardness is caused by the presence of alkaline earths, primarily calcium and magnesium. Total hardness is measured as the sum of all calcium and magnesium ions in drinking, natural water, wastewater and water in heating systems (boilers, etc. ).